This appium automation tutorials will take you from beginning level to advanced level in android software app automation testing. Appium software testing tool is freeware mobile automation testing tool using which you can automate native, hybrid and mobile web software apps of android and IOS. If you wants to make career in mobile automation software testing then appium is best tools for you. Now a days, many software companies has started using appium as a mobile automation testing tool so it is very important for mobile test engineers to learn appium for better future and growth. As per my view, Nearest 40 to 50% websites will be converted in mobile app in next 5 to 10 years as usage of mobile apps is increasing day by day. At present, It is great opportunity for each mobile tester to learn appium very quickly so that he/she can work on appium in upcoming days. I have prepared bunch of appium tutorials for those beginners who wants to build their career in mobile automation testing industry. 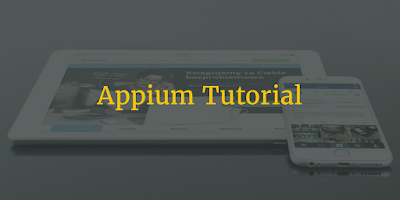 Go though bellow given appium tutorials steps by step to learn appium automation very quickly. please provide me some basic requirments needed to learn appium tool ..
hi arvind, please help, i am getting the below error on executing appium test, its just invocation of the apk. Can we download the above video tutorials once we take that course or only access? Thanks a lot, for valued contribution to the community.. I think- the 1st sentence mentioned in the the Footer quote is really applied by Arvind through his contribution. Really great informative work..Keep it up..! can we add SIKULI to Appium? I have followed all the steps mentioned in this site and generated the script for running an app in my mobile. the code was running without any errors but its not showing any implementation on my phone app. Please share abt iOS setup.. Thanks so much. Your blogs helped me a lot. How do I in a mobile automation to give a "Back" by the button of the device that is not in the ??? Nice one.. Good help for others.. These tutorials are really really good. Thank you very much!